During the 1930s, while the Great Depression was wreaking havoc, the sport of skiing was born in the Canadian Rockies. The roots of skiing in Alberta and BC go back to the 1890s when pioneers like Olaus Jeldness organized ski jumping competitions in Rossland, and than later to Revelstoke and Banff where winter festivals were born. But these events were largely for professional or semi-professional skiers and everyone else was a spectator. In 1928 the public came to the slopes as active participants; the first ski lodges were built; Mount Norquay, Lake Louise and Sunshine Village Ski Resorts were established; the Alpine Club of Canada held its first ski camps and the sport of ski mountaineering was born. Out of the dark days, a new industry was born. It began in March 1928 when Italian nobleman, the Marquis d’Albizi, and Norwegian ski adventurer, Erling Strom, led four clients (from the Lake Placid Club in New York State) from Banff to the stunning meadows below Mount Assiniboine. Staying in cabins built years earlier by A.O. 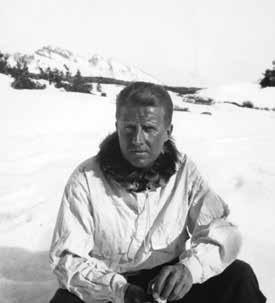 Wheeler, founder of the Alpine Club of Canada, they discovered the deep snow and incredible scenic beauty of the region. It was a skier’s paradise. Returning from their adventure the pair soon approached the Canadian Pacific Railway with the idea of building a lodge in the area. 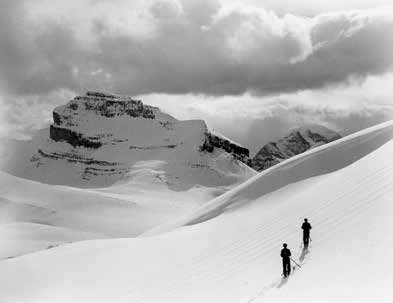 The CPR received the idea enthusiastically and the next summer Mount Assiniboine Lodge was built — the first backcountry ski lodge in the Canadian Rockies. Meanwhile a group of young skiers from Banff including Cliff White, Peter Whyte, Cyril Paris and Fulton Dunsmore formed the Mount Norquay Ski club and built a cabin high on the slopes above Banff. Officially opened on February 3rd, 1929, their ski camp became a big hit with locals. Soon Calgarians caught on and hundreds of people came out on the weekends walking up then sliding down the hill. There were no lifts in those days, of course, and for the first half dozen years skiers had to ski or walk up the trail from Banff to reach the cabin. rate in Canada reached 27%. The Western Canadian provinces were particularly hard hit. Undeterred by this, the Mount Norquay Ski Club, led by the enthusiam of Cliff White and Cyril Paris, undertook to build a skier’s cabin in Skoki Valley, in the mountains east of Lake Louise. 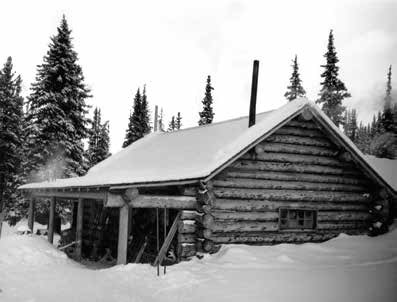 Constructed by log builder Earl Spenser in the autumn of 1930, the cabin received its first guest, Russell Bennett, an American millionaire and ski adventurer, on March 12, 1931. Not long after the group changed their name to The Ski Club of the Canadian Rockies, a name they thought would have more appeal. Although Skoki Lodge was originally built as a base for club members only, it was really the beginning of what would become the Lake Louise Ski Resort. A third backcountry paradise, called Sunshine Lodge, saw its first paying guests in February, 1934. Originally built for the Trail Riders of the Canadian Rockies, this cabin and the surrounding ski potential was discovered by Jim Brewster, wife Dell, brother Pat, and Austin Standish the previous year while exploring for new terrain to ski. Located along the Continental Divide, the snow was deep and the terrain excellent. In 1936, Brewster Transport built a new 40 person lodge which still stands today at the heart of the resort. Not to be left out, skiers from Jasper — Curly Phillips, Joe Weiss and Doug Jeffery — built a beautiful cabin in the mountains near Maligne Lake. They called it Shangri La, in reference to James Hilton’s popular book about an imaginary paradise high in the Himalaya. Constructed in 1936, the cabin and several others built nearby opened up the tremendous potential of the region. Many other ski developments occurred during the 1930s. 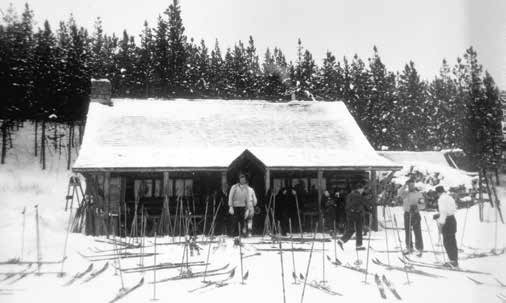 The Alpine Club of Canada held their first ski camp in April of 1937 based at the Elizabeth Parker Hut at Lake O’Hara. This began a tradition of backcountry ski camps that is still popular today. Skiers like Rex Gibson pioneered the sport of ski mountaineering, whereby the great summits of the Rockies are reached on skis during the cold winter months. Today ski mountaineering is one of the fastest growing segments of the ski industry. all the way from Jasper to Banff. Today these ‘Grand Traverses,’ as they are called, are a distinctly Canadian activity and popular with the young and hardy. would bring skiers from around the world. But, unfortunately, timing was bad. In September of 1939, just as Temple Lodge opened its doors, German tanks roared into Poland and thus began the Second World War. The war marked the end of the Great Depression but it also brought to an end this creative and adventurous period in Canadian skiing. For the next six years gas was rationed and travel was restricted across the country. All of the nation’s energy, seemingly, went into the war effort. Mechanized skiing took over after the war. The skiing industry dramatically changed. The very first chairlift was built at Mount Norquay in 1948, the gondola was built at Lake Louise in 1958, and at Sunshine Village Ski Resort, in the 1960s, four chairlifts and T-bars were built. In 1965 Hans Gmoser took it all one step further with the use of the helicopter as a mobile ski lift. Mount Assiniboine Lodge, Skoki Lodge and Shangri La have become busier than ever. Ski mountaineers explore every nook and cranny of the backcountry for powder snow. And the really hardy set off on week-long ski treks through the hills. The snow is deep and the scenery spectacular. The wilderness is at our doorstep but we are also served by all the modern conveniences. 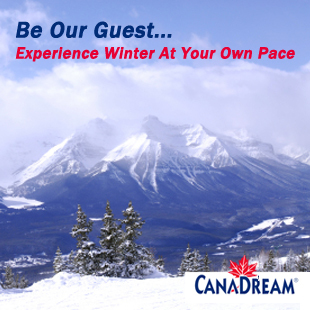 A skier in the Canadian Rockies can now truly enjoy the best of both worlds.